Mary writes: Finally, after much technical difficulty...recorded and edited, added the images and loaded it to a faulty flash drive... twice... the camera battery died on me... this was a challenging assignment. I hope you like it. I am pretty proud of it. Here's my digital trailer. This 2011 poetry book is a great one for cross-curricular connections. 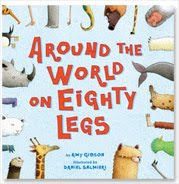 I would use this book as an introduction for a science lesson on animals. Prior to beginning the research process on specific animals, this would allow students to see where many animals live as it cleverly categorizes the animals in their native habitats within geographic regions shown on the maps on the end pages. Sharing poems from the book might entice students to research animals that are lesser known. What a fun and fabulous way to broaden students’ learning. After students complete their research, have them write a poem about the animal they studied and display their poems in the library.